Spider mites are an important arthropod pest of strawberries in California. Plants are especially sensitive to damage early during the season. While the Oxnard area strawberries were hit by early and heavy infestations of spider mites, especially the twospotted spider mite, Tetranychus urticae, several growers in the Santa Maria area reported achieving good control by releasing predatory mites and timely applications of miticides. Predatory mites continue to play a major role in managing spider mites in strawberries and it is important to understand the impact of miticide applications on these beneficial arthropods. Miticides vary in their impact on natural enemies and their safety to predatory mites is usually determined based on laboratory assays. This information is critical in making treatment decisions when predatory mites are also used for spider mite management. This article presents predatory mite (Phytoseiulus persimilis and Neoseiulus spp.) data from miticide evaluation studies conducted on commercial strawberry fields in 2011, 2012, and 2013 in Santa Maria. 2011: A small study was conducted to evaluate the efficacy of abamectin (Agri-Mek 0.15 EC, 16 fl oz/ac) and cyflumetofen (Nealta SC, 13.7 fl oz/ac) where treatments were applied twice using a backpack sprayer. A 100 gal/ac of spray volume was used. The second treatment was made 21 days after the first. Ten mid-tier leaflets from each plot were randomly collected and mites were counted using a mite brushing machine. Predatory mite numbers were available only from observations made 27 days after the second treatment. The average number of predatory mite adults was 2.5, 0.5, and 0.75/leaflet for untreated control, abamectin, and cyflumetofen, respectively. 2012: A small plot study was conducted using abamectin (Agri-Mek 0.15 EC, 16 fl oz/ac), bifenazate (Acramite 50WS, 1 lb/ac), entomopathogenic fungus, Beauveria bassiana (BotaniGard 22WP, 4 lb/ac), B. bassiana (BotaniGard 22WP, 4 lb/ac) + fenpyroximate (Fujimite 5EC, 2 pt/ac), cyflumetofen (Nealta SC, 13.7 fl oz/ac), fenpyroximate (Fujimite 5EC, 2 pt/ac), and spirotetramat (Movento, 5 fl oz/ac). Treatments were applied only once using a backpack sprayer (200 gal/ac for all and 150 gal/ac for B. bassiana treatments) and mite counts were made 0, 3, 7, 14, 21, and 28 days after treatment (DAT). Four days after the treatment, Microthiol Disperss was applied as a fungicidal treatment across the entire field and that could have had an impact on spider mite and predatory mite populations. Average number of predatory mite egg and mobile stages varied across different observation dates, but the differences were not statistically significant (Tukey's HSD P > 0.05). 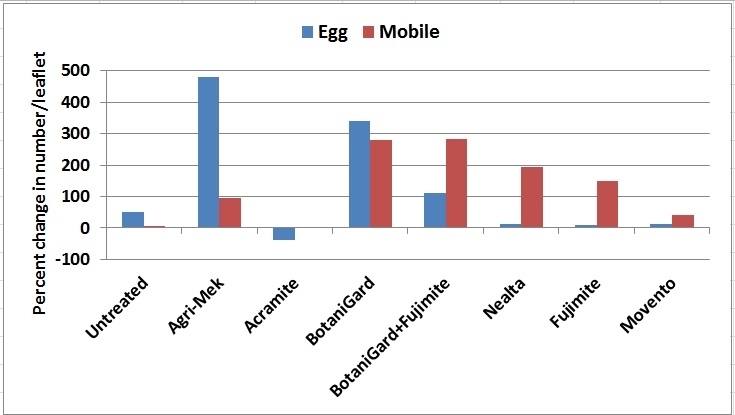 Number of predatory mite eggs and mobile stages at different time intervals before and after a single application of various miticides in a field study in 2012. Pre-treatment numbers and post-treatment average for eggs and mobile stages of predatory mites, 2012. Percent change in eggs and mobile stages of predatory mites after treatment (average for post-treatment counts), 2012. It was not clear why there were fewer predatory mite eggs and mobile stages in untreated control than some of the treatments throughout the observation period. When the percent change in post-treatment average was compared to the pre-treatment average, there was a 50-480% increase in predatory mite eggs and 7-280% increase in mobile stages in various treatments except for bifenazate where there was a 37% decrease in the number of eggs and no change in mobile stages. 2013: In a small plot trial, the efficacy of bifenazate (Acramite 50WS, 1 lb/ac), abamecting (Agri-Mek SC, 4.29 fl oz/ac), B. bassiana (BotaniGard ES, 1 qrt/ac) + bifenazate (Acramite 50WS, 0.75 lb/ac), Eco-Mite (rosemary and cotton seed oil, 1%), fenpyroximate (Fujimite 5EC, 2 pt/ac), fenpyroximate (Fujimite XLO, 2 pt/ac), Chromobacterium subtsugae strain PRAA4-1 (Grandevo, 2 lb/ac), Burkholderia spp. strain A396 (Venerate XC, 2 gal/ac), and cyflumetofen (Nealta SC, 13.7 fl oz/ac) was compared. Treatments were applied twice at weekly intervals using a backpack sprayer at 150 gal/ac rate. Mites were sampled 3 and 7 days after each application. There was some variation in predatory mite populations in treated and untreated plots throughout the observation period. Significant differences were seen only on observations made 3 days after the first spray in eggs and 7 days after the first spray in mobile stages (Tukey's HSD P < 0.05). 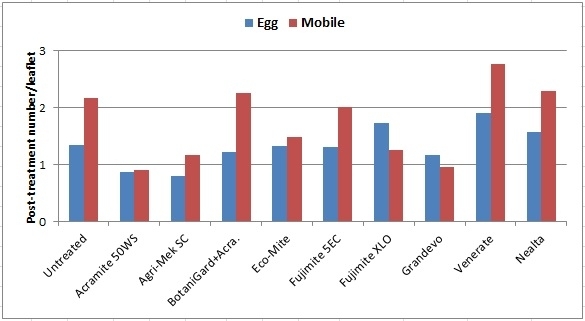 Number of eggs and mobile stages of predatory mites on 3 and 7 days after first and second applications of various miticides, 2013. Average number of eggs and mobile stages of predatory mites from four observation dates following two miticide applications, 2013. Although the number of predatory mites or their eggs was not statistically different, average for four observation dates indicates their response to chemical, botanical, and microbial miticides. These results may not correspond with those from laboratory studies conducted under controlled conditions, but they show the relative abundance of predatory mites in response to various miticides under field conditions.